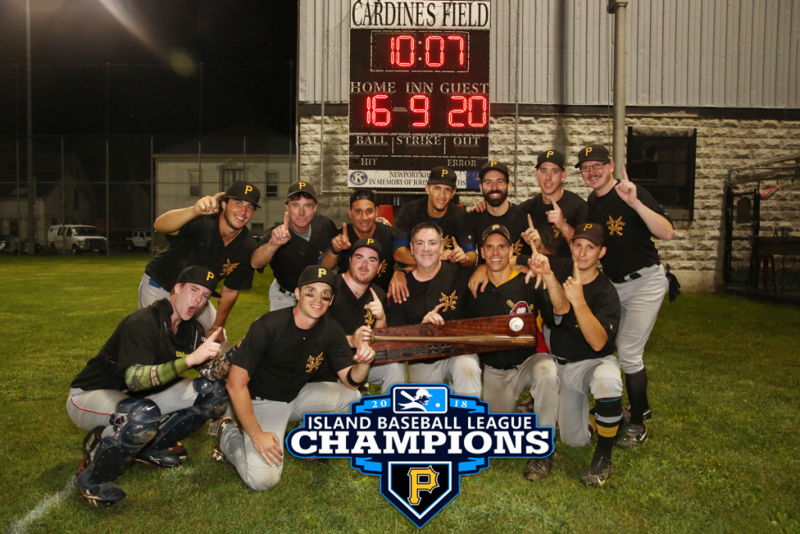 On a warm night in September, Island Baseball culminated their 10th season with a 2012 rematch between the Fifth Ward Pirates and Narragansett Navigators at Cardine’s Field. The last time these two teams met in 2012 it ended in an epic 11-inning battle. League MVP and rookie of the year Dylan Smith and IBL home run Leader Robbie Harrington both suited up for their first championship game, while other Pirates vets were looking to win their second IBL trophy. As three-time winners, the Navigators were looking to add a 4th to their mantle with vets Todd Bartolomei, Gary Vaspol, James Pierce, Joe Cassidy, and Rusty Forgue leading the charge. The game that ensued would be one each player and attendee would never forget. To begin the festivities, Jaclyn Reynolds, wife of Pirates outfielder Wyatt Reynolds, threw out the first pitch in honor of her mother, Julie. She was an avid baseball fan and attended every Pirates game. 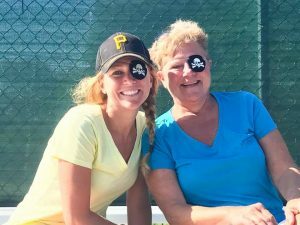 Jaclyn Reynolds (Left) enjoying a Pirates game with her mom Julie Richardson (Right) in 2017. The Navigators sent Zach Greene to the mound to start the game and immediately made his presence known by striking out 5 through the first 4 innings, giving up only 3 hits. Teddy Horan started for the Pirates giving up only 2 runs through the first 3 innings. The Pirates kept the Navigators in check with Pirates outfielder Alex Dresser robbing Todd Bartolomei of what could’ve been extra bases. The Navigators however managed to take an early 2-0 lead off a couple of key errors. The Navigators continued the charge with 5 runs in the 4th inning to make the score 7-0. The Pirates started returning the favor in the 5th inning with a lead off triple from Dylan Smith. The Pirates would continue adding runs in the 6th inning with consecutive singles by Terry Horan and Michael Cecchi. Pirates outfielder, Wyatt Reynolds, stepped to the plate and singled in Horan. Walks to Adam Johnston, Teddy Horan, and Robbie Harrington scored 3 more runs to make the score 7-6 Navigators. Just as the Pirates appeared within striking distance, the Navigators would strike back with 4 runs in the 7th to make it 11-6. Josh Schneider took the hill in the 7th for the Navigators and established his presence striking out 3 pirates and only giving up one hit to Scott Emond. For the Pirates though, the game was far from over as they got a 1-2-3 8th inning from Teddy Horan who re-entered in relief. This would spark one of Island Baseballs biggest comebacks in championship history. Leading off with a single was Pirates 1B Nick Lutes, who very quickly got to third with a stolen base and passed ball. With 2 two-out walks to Teddy Horan and Devin Johnson, Dylan Smith brought everyone in with 3-run double. Dylan would score on a Robbie Harrington single bringing the score to 11-10 Navigators. Holding the Navigators scoreless in the bottom of the 8th, the Pirates continued the hit barrage in the top of the 9thwith consecutive singles from Scott Emond, Sean McElroy, and Terry Horan. Pirates catcher Michael Cecchi stepped to the plate and roped a single up the middle to tie the game 11-11, which brought the Pirates dugout alive. It got even louder when Alex Dresser stepped to the plate and on an 0-2 count sent the head of a broken bat flying back up the middle towards the pitcher. A wild throw on the fielder’s choice to home plate would give the Pirates a 12-11 lead. From there, a series of walks, singles, and an a Adam Johnston double to right field would give the Pirates a 20-11 lead. Going into the bottom of the 9th, the Navigators brought out the bats and slugged their way to a 20-14 score. Pirates would bring in Michael Cecchi for the close. After allowing two runs to bring it to 20-16, Cecchi would end the came on a call third strike. This ended a 4-hour battle between two high powered offenses, which proved to be one of the highest scoring championship games in league history. Pirates would overcome error adversity and responded with everyone getting on base and producing in ways this league hadn’t seen in a long time. For some, it was a culmination to their own personal baseball careers, and to others, it was the beginning of their IBL careers.